The We Are Living Stones Capital Campaign is a historic initiative that will ensure that we, the Roman Catholic Archdiocese of Newark, will remain a strong, vibrant and faithful Church for years to come. We know that the greatest treasure is our Catholic faith; the source of our strength and nourishment as we journey through life. This campaign is primarily focused on just that; the spiritual growth and development of the people of this great Archdiocese. As generations past have solidified their legacy, your generosity towards the We Are Living Stones Campaign will create a legacy for this generation. This legacy of faith will be passed onto the next generation to accept, cherish, and carry into the future. All 214 parishes have completed their efforts toward the We Are Living Stones Campaign, and God has certainly blessed the work of His People. The Campaign continues to move strongly towards its goal of $90 million, with nearly $87.6 million in pledge commitments to date. Parishes throughout the Archdiocese have broken ground on various capital projects with over $24 million already distributed to qualifying parishes. The We Are Living Stones Capital Campaign continues to focus on strengthening our parishes while building a bright future for the entire Archdiocese. We ask that you continue to pray for the success of this campaign both at your local parish, as well as at your neighboring parishes throughout the Archdiocese of Newark. Thank you for your consideration and your participation in this endeavor. Please do not hesitate to contact the Office of Development and Stewardship with any questions or concerns regarding this campaign. You may reach our office at (973) 497-4332. The above chart is reflective of gifts received through December 31, 2018. **Report includes gifts reported as of December 31, 2018. 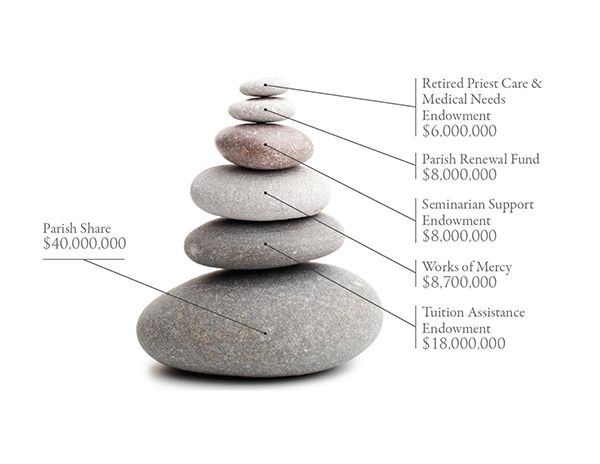 The We Are Living Stones Capital Campaign will provide the solid foundation upon which our Church will continue to build and enhance the future for all one million Catholics across Northern New Jersey. Financial resources are essential to enable our parishes to continue supporting the journey of faith, spirituality and ministry of our expanding Catholic community. As we embark on the We Are Living Stones Capital Campaign, we look forward to the future, confident that all of our Brothers and Sisters of Christ will consider a sacrificial gift and join together to raise the important funds. Please join us in praying for the success of this campaign by clicking here!